Thanks to a recent comment, I’ve been made aware of an error. Well, at least it appears to be an error. There are two headstones in the Winchester National Cemetery in Winchester, Virginia that are mix-match in nature when it comes to data and design. Really, this is no great surprise. As I mentioned in an earlier post, when I first saw the headstone of a cousin buried at the cemetery at Andersonville National Historic Site, in Andersonville, Georgia I realized that his stone listed the wrong name and state from which he hailed. Then too, at Staunton National Cemetery in Staunton, Virginia, I found a headstone that bore the name of a soldier who died in the Luray Valley in October 1864 (Rather rare when considering graves in the National Cemeteries in the Valley but I have some rather specific details about how he died). Funny thing is, he has another headstone at Grafton National Cemetery in Grafton, West Virginia. I feel pretty sure that they didn’t select different parts of his body and send the two halves to the two different cemeteries, but I rather believe this to be an administrative error. FYI, for those with inquiring minds, there is a pretty good history of Veterans Administration headstones available on the Web. 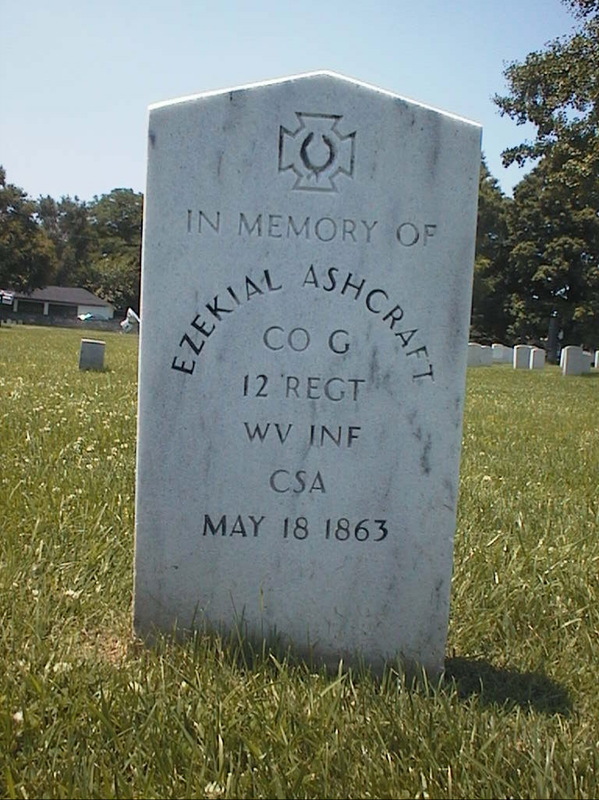 Ezekiel Ashcraft’s stone identifies him as a member of Co. G, 12th West Virginia Infantry. That’s all fine and dandy, except the next line really throws thing off as it identifies the unit as in the service of the “CSA.” I really doubt that any self-respecting Confederate would admit to an affiliation, in any form or fashion, with the “break-off state.” Anyway, other “Confederate identifiers” on Ashcraft’s headstone include the distinctive pointed feature at the top of the stone and the “Confederate Cross of Honor” (with a wreath inside the maltese-type cross). Incidentally, since the 12th West Virginia was a Union unit, the distinctive recessed Union shield is absent from the headstone. Also, note that this headstone has “In Memory Of” engraved on the top, just under the Confederate Cross of Honor, meaning, this soldier isn’t really buried here. Ohhhhh, I hope this isn’t another case of a descendant thinking he knows better than his own ancestor as in the case of my posting about Stephen S. Shook. Then, we have the stone of J.V. Sims. 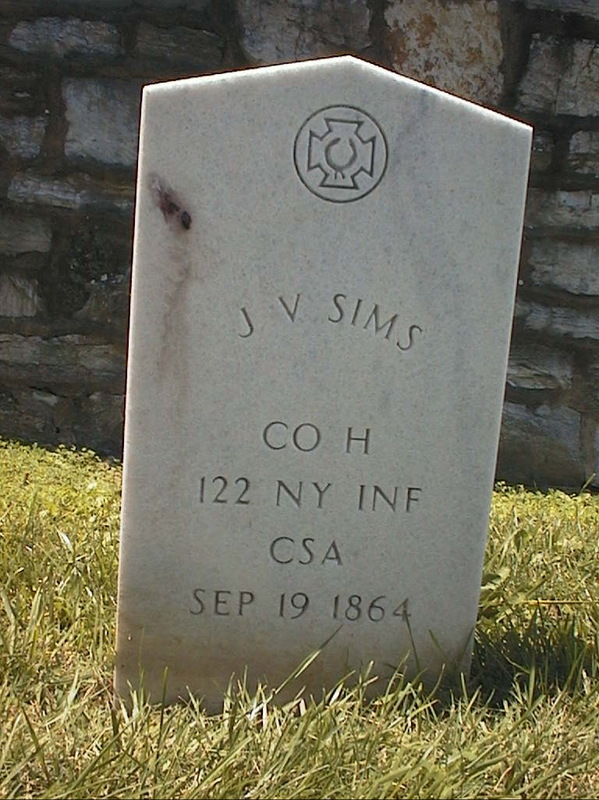 First Lieutenant John V. Sims of the 122nd New York Infantry, according to the website created in honor of the 122nd NY Infantry, was a member of Co. H, having served as a 1st lieutenant with the company from 8 July 1864 through until his death at Third Winchester on 19 September 1864. As with Ashcraft’s stone, Sims’ stone has some of the same features that would falsely identify him as a Confederate soldier, but, in contrast with Ashcraft’s stone, that “122nd NY Inf., CSA” stands out like a sore thumb. I’ll keep you posted as more details come to my attention. Great detective work Robert. As you could probably tell I’m not much of a grave digger myself. I’m better with tracing down artillery pieces by the numbers on their rimbases. Thus far, what you’ve uncovered confirms some of my suspicions. I’m inclined to believe there’s mix of tribal legend with some nugget of truth. But they probably weren’t spies. Just doesn’t pass the probability and practicality filters. Thanks Craig. I like to do a little “tree shaking” from time to time to get to the truth. Hopefully, we can get to the root of this. It is either an assumption and another instance of spiraling Civil War “memory” or it has the potential to be a very interesting story. IF there is any truth to the spy thing, I still think the upright headstones should be replaced. I just hate the idea of how these two stones in their present state might lead first-time Civil War tourists to a series of confused understandings about the war and the people in it. Update… I find it curious, but Culpeper National Cemetery, which is responsible for overseeing Winchester National Cemetery, has not yet replied to the letter that I sent three months ago. Time for a follow-up. Hi, I was browsing and found your blog and was wondering if you found out anything else about Esekiel Ashcraft’s stone. Ezekiel was my great-great uncle and I have been trying to find out all I can about him and his brothers and trying to find out if his brother, my great grandfather, Nathan Harrison Ashcraft served in the civil war. I have found a little bit about Uncle Ezekiel and his brother Uncle Armstead but nothing about grandpa. I enjoyed your blog. Thanks for commenting. No, I’m afraid I never heard from the National Cemetery, but still want to see that the headstones are corrected. Otherwise, I looked in the Soldiers and Sailors NPS database and saw that a Nathan Ashcraft served. His name is in two West Virginia regiments. Not sure if that reflects two people or both were one in the same. Thanks for checking-I have also found 2 different Nathan’s, but nothing to show if either are mine or not. I will keep reading your blog. Robert — anything new here? I’d love to see Ashcraft get a new marker. I am pleased to report that the headstone of my great grand uncle John V Sims has been replaced as of June 2014. His new headstone now reflects his honorable service as a proud member of the 122nd New York Volunteers. I and my extended family are very pleased that this was accomplished before the 150th anniversary of his sacrifice to the Union of the United States of America. And Robert Moore, I have to thank you for this blog entry which was included along with a multitude of documentation that I provided to the Assistant Director of the National Cemetery Administration to support the fact that John V Sims’ headstone was incorrect and should be changed to honor his service. Great to hear, Jennifer. I’m very glad this has been corrected, and… most especially that the blog post could be of service! I need to stop by and take a look… and look at Ashcraft’s marker as well (in the hopes that it too has been corrected).